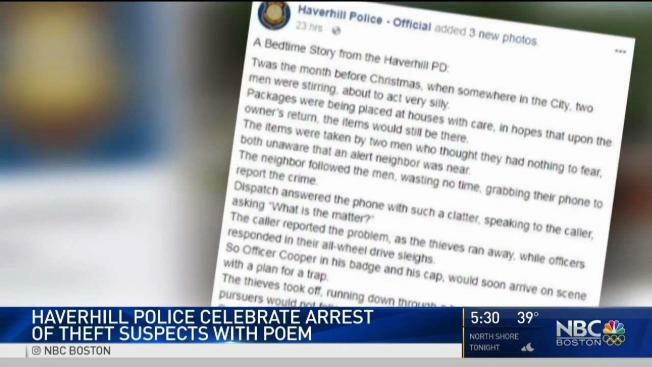 A poetic post from the Haverhill Police Department to the tune of a classic Christmas tale is going viral after a neighbor helped the officers catch a pair of package thieves in the act. Nicholas Parker, 20, of Haverhill, and Brandon Carroll, 25, of Atkinson are facing charges of larceny and trespassing. The rhyming arrest report was posted on Facebook and written in the form of "'Twas the Night Before Christmas." "The items were taken by two men who thought they had no fear, both unaware an alert neighbor was near," police wrote. The theft happened last week on Cedar Street. Stephanie, who declined to give her last name, is the alert neighbor and says she was stunned to see two men swipe the package right off of a porch. "I just knew police would need help finding them," she said. "And I know right from wrong." She took off after them, eventually getting into her car while calling the police. "The caller reported the problem, as the thieves ran away, while officers responded in their all-wheel drive sleighs," the post went on to explain. Police said the gifts were returned, the alleged thieves were arrested and the officers were pleased with themselves. "It was the nature of the call," Officer Ryan Connolly said. "This was a good outcome. We were able to return them – these were Christmas gifts." It's not clear is the suspects have attorneys.